For the record, rather than a “100-fold increase” there has been no upward trend in hurricanes or other extreme weather events. The increased number of catastrophic fires in the West is due almost entirely to criminally negligent federal mismanagement of our National Forests. See my CEI colleague Marlo Lewis’s recent summary of current climate science to see how very far from reality are Mr. Gore’s claims. 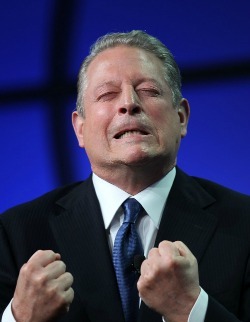 And as he always does, Mr. Gore couldn’t resist making some nasty comments about his opponents. He likened the “raging deniers” (as in Holocaust deniers) to racists who supported apartheid and earlier opposed the abolition of slavery and to homophobes. Mike Bastasch’s piece on the Daily Caller asked several “deniers” (including me) for reactions to Gore’s attack. Wesley Pruden mounts a rhetorically brilliant counter-attack in his Washington Times column. Previous post: Why Did China Reject Binding Emissions Limits at Kyoto?